I spoke to many choir members after the concert and everyone seemed to be thrilled with the whole experience. A wonderful evening singing some truly great and moving music. 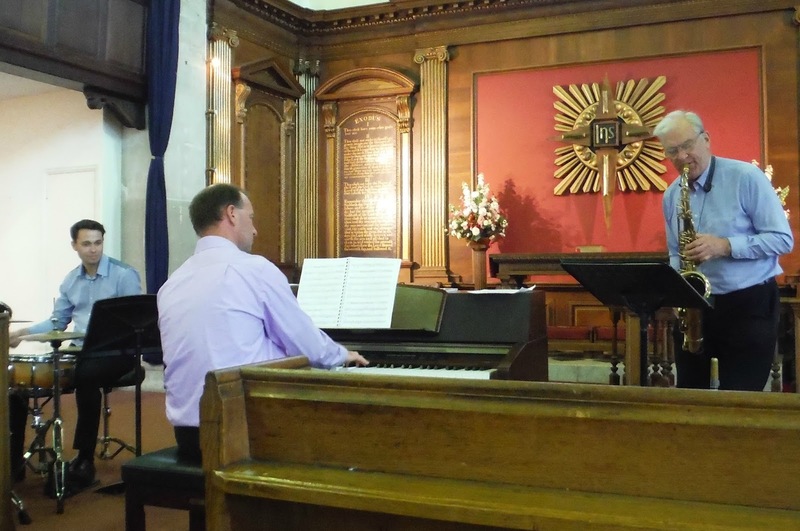 Daniel Thomson and Mick Latimer, our tenor and bass soloists, said what a great atmosphere there was in the church and how well the audience responded making it easier for them to sing with feeling. ‘We really enjoyed the performance on Saturday, congratulations to you all. 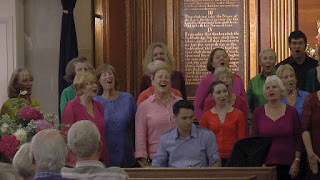 As I write this, three days hence, the sound and atmosphere of the Choir’s performance are still so very, very strong. I felt the whole performance was absolutely magnificent and somehow a very emotional experience – in fact, I’m still finding it very difficult to speak about it. As the ‘Worthy Is The Lamb’ moved into the ‘Amen’ – I actually felt I had become an Angel ….. I know these words will bring many differing comments and no doubt some scoffing, but, truly, that’s how your performance affected me – it was so utterly magical, uplifting and inspiring. “Many, Many Congratulations Andrew” – from Us All. 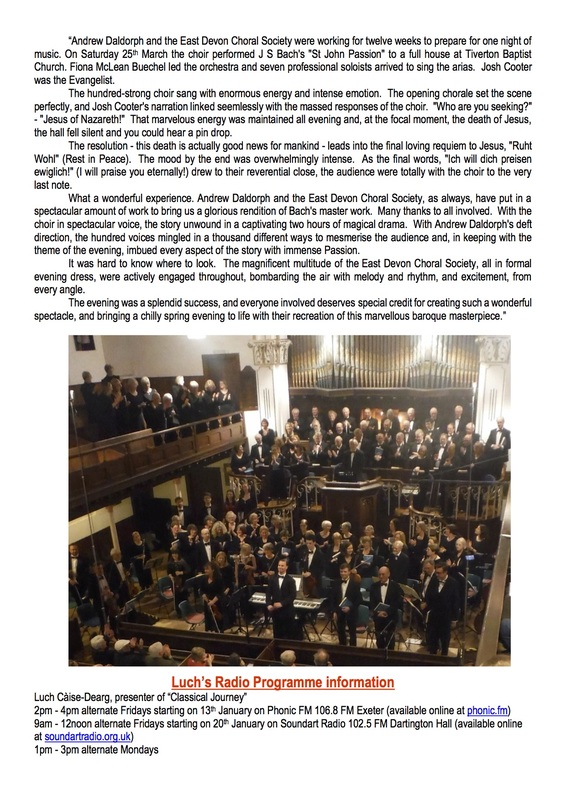 Sue, can I offer my warmest regards and Congratulations to You and to All members of EDCS – it really was a wonderful concert and such a privilege to be present. The Baptist Church provided the perfect intimate setting to listen to and to enjoy this magnificent work – a wonderful precursor to the contemplation of the Christmas message. The musical director, Andrew Daldorph was masterful in orchestrating the different elements – the choir, soloists, orchestra and instrumentalists – to deliver a performance of the Messiah that was readily available to the large and very enthusiastic audience. The Choir excelled themselves and importantly seemed to flourish in the process of bringing fresh excitement to this familiar masterpiece. Congratulations to all concerned for energizing the cultural experience of Tiverton. I was so deeply touched to hear that Andrew was intending to use my theories on Notes Inégales in his Christmas Messiah – the performance was a triumph for everyone involved. It was a truly wonderful performance – it far exceeded my expectations and for me, this Messiah, performed with such feeling by ALL, will be the perfect start to Christmas. To All at EDCS, Thank You So Much. Such a strong, vigorous and well-disciplined performance, every moment holding the audience’s attention by the unusual and exciting interpretation of the Messiah score …INSPIRING! Thanks for a FABULOUS evening of music Sue and All at EDCS. 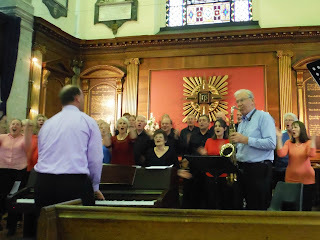 Fiona (leader) and Brian (trumpet) were magnificent – hold on to them! Andrew did some very clever things with the Choir this time which they worked with very effectively. Verity also did something very special with the alto arias which I particularly liked. Here’s to May 12th 2018!! 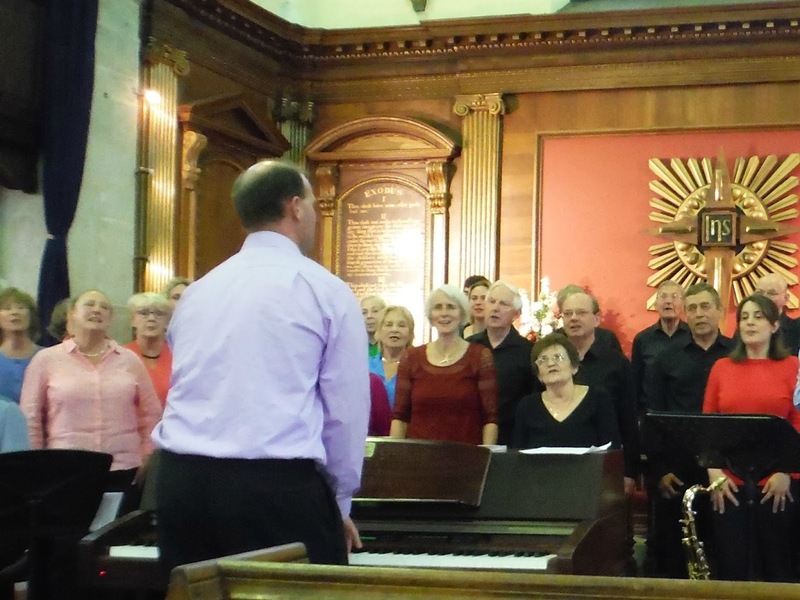 The East Devon Choral Society are well known for their spectacular performances of baroque and classical masterpieces at Tiverton Baptist Church, with full orchestra and Colin Pettet playing the impressive Willis organ. For this weekend’s concert the choir sang with only minimal accompaniment. Director Andrew Daldorph demonstrated his amazing ability to play complicated melodies on the piano from a standing position, while simultaneously conducting a full choir. In a new departure, Andrew had also done away with musical manuscripts and songsheets. Every song was learned by ear and sung from memory – with everyone’s attention firmly fixed on the Andrew for direction. The change was immediately noticeable, with the relationship between conductor and choir much more visible to the audience than ever before. Every pair of eyes was looking up and outwards sharing their animation and excitement with the audience. The first three numbers were from the renaissance, and eased the choir into unscripted song. Greensleeves is well known, and the men concentrated on a wordless continuo. Orlando Gibbons‘ “Silver Swan” has a more complicated lyric, with counterpoint, but ironically relates the misconception that swans themselves do not sing – until they are about to die. Andrew also had some fun with Johann Pachelbel‘s “Canon & Gigue” for violins and continuo. He had arranged this as a beautiful vocalise for multiple voices, with no words at all. 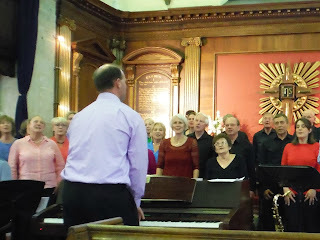 The choir worked their magic deftly, sending waves of pure delicious sound wafting over the audience, to the astoundingly delicate accompaniment of Andrew’s piano playing. What a lovely opening to a concert – with the promise of much more to come. 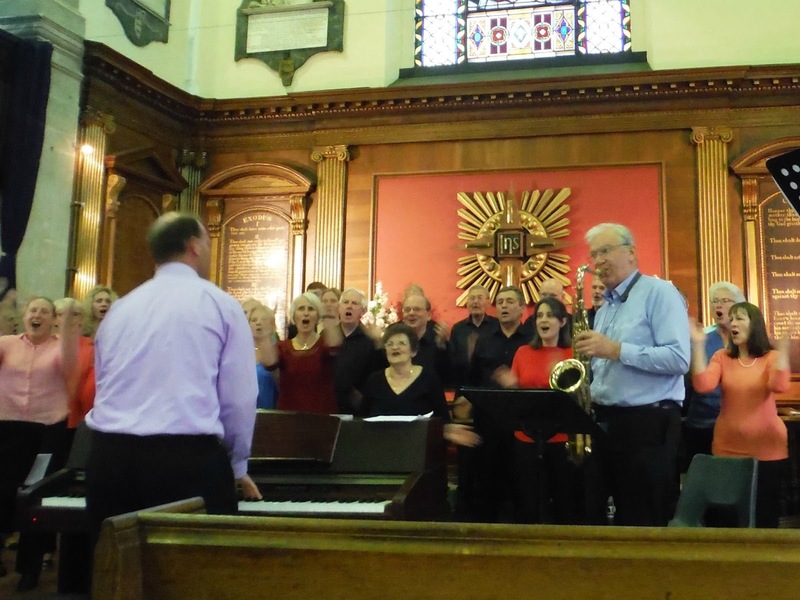 The choir then had a chance to take a rest, as Andrew was joined by an informal jazz band convened for the evening. Steve Douglasplayed the drums and Chris Gradwell played the tenor saxophone in a smooth and lively version of Thelonious Monk‘s “Blue Monk” with Andrew playing the piano, and a slightly mysterious guest playing the electric bass guitar. The mystery was soon resolved, as Andrew introduced Verity Stroud, one of his music students at Exeter School – and a very accomplished one. Verity is a Grade VIII piano student, as well as guitarist. She also plays the bassoon – and had been bassoon soloist in a performance of Mozart‘s “Bassoon Concerto in B flat” earlier the same week. Verity’s main contribution to the evening was still to be revealed. Andrew has been Verity’s singing teacher, and came to realise that she has the perfect voice, and temperament, to perform his own compositions for jazz band and voice. Together they have made an album of classic songs and Andrew’s own compositions. With Steve, Chris and Andrew providing a emotive introduction and accompaniment, she sang the title track from the album: “On You, Beloved Eyes“, while accompanying herself on bass guitar. Her voice is very sensual, and blends perfectly with the instruments of a jazz quartet. Before the interval there was also time for two more of Andrew’s jazz numbers, “It‘s You My Love” and ” Since You Are Here“. 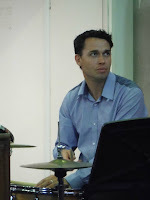 The percussionist on the album is Gary Evans, and Steve Douglas had prepared for only a few days for this performance. Regardless of this, his gentle rhythms were perfect – and infectious. The album also features Mike Thorn‘s double bass. Copies were available at the Church – produced by “Musical Squares” – i.e. Mike & Wendy Gluyas. The choir then returned for two more songs. First Andrew led a very sombre arrangement (by himself) of Charles Villiers Stanford‘s “Blue Bird” for female voices and piano only. 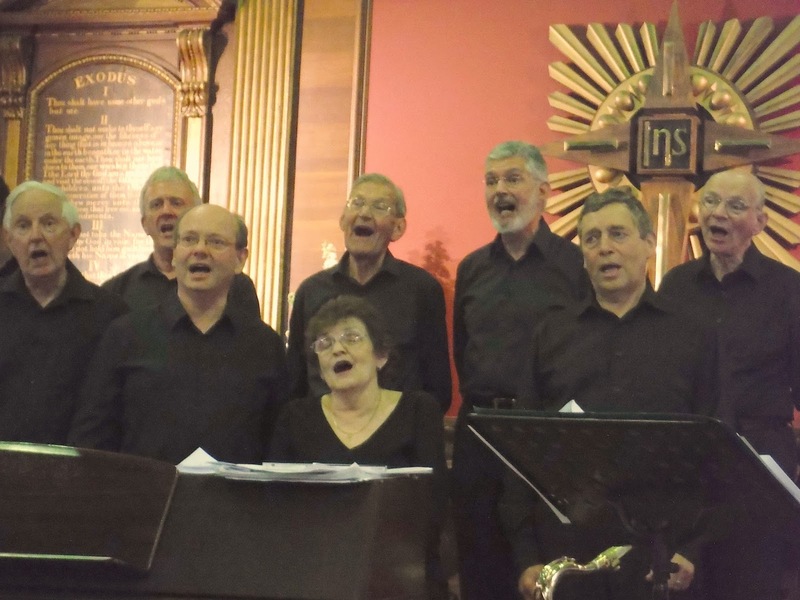 The men soon joined in, with full band including Verity’s bass guitar, to sing the traditional spiritual (with a distinct, albeit spurious, West Country flavour), “Kum Ba Yah“. 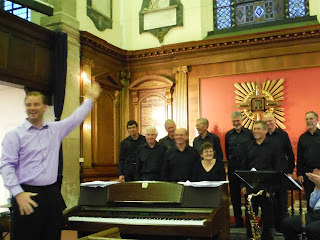 To ensure that the choir members did not forget which verse they had reached, Andrew mimed the actions at each reprise – a very effective form of direction. The theme “Colours of Love” had slightly slipped with this campfire song, but the first half ended with a rousing spiritual hymn which combined all of the elements. 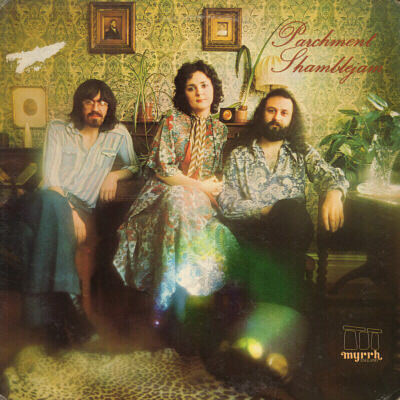 “Colours of the Day” by ‘Parchment‘ (Keith Ryecroft, Sue McClellan & John Paculabo) – also subtitled “Light up the Fire” – did just that. The exciting Christian message of Jesus’ impending resurrection was expressed jubilantly in words and actions. And the choir were joined at the opportune moment by the full band to end with several exuberant choruses and a final exultant cheer. The interval was passed pleasantly in the churchyard, with wine, soft drinks and snacks served in the church centre. After a pleasant half hour in the evening sunlight, the audience returned. Verity welcomed everyone back with an unscheduled rendition of another of Andrew’s romantic compositions, “When I Saw You Standing There“. Then a tenor from the choir introduced the benefit charity. Peter McLean-Buechel has reason to be grateful to the British Heart Foundation for all their help and support when he had cardiac surgery last year. In a witty and moving exposition, he summarised the many benefits provided by the charity. The Foundation works in all parts of the country, and is currently spending £26M on 87 projects in Exeter and Bristol. They have provided over 2,000 publicly accessible defibrillator units, and supply CPR units to schools. They also fund cardiac nurses, and a 24 hour helpline service. Proceeds from ticket sales go to the charity – along with donations from audience members. Andrew echoed Peter’s sentiments – especially applauding the Foundation’s work to keep one of his tenors in good health. The rest of the choir then joined Peter on stage for something a little bit different, Dorothy Gale‘s impassioned ballad from “The Wizard of Oz“, “Over the Rainbow” by Yip Harburg, with music by Harold Arlen (adapted, of course, by Andrew Daldorph). In a more exotic vein, Oswald Durand‘s Haitian song “Choucoune“, set to music by Michel Mauléart Monton, and translated into English as “Yellow Bird” – a delightful contrast to Dorothy’s bluebirds. This entertaining anthropomophic romance, sung by the women and accompanied by male chorus and drums, rekindled the jazzy feel of the evening and set the scene for a classic instrumental jazz number. Steve Douglas provided the ever-familiar brushed cymbal introduction to Henry Mancini‘s Academy Award winning theme to Blake Edwards‘ “The Pink Panther“. Chris Gradwell‘s tenor saxophone playing totally recalled Plas Johnson‘s original – and Andrew’s switching between genres was as impressive as ever. A song with everlasting appeal. Verity joined the band on bass guitar for Sonny Burke‘s wartime lament “Black Coffee“, and sang two more of Andrew’s compositions with the band, “And I Want to Hold You” and “I‘m Comin‘ Back Home“. Verity’s singing reached new heights on intensity, as she poured ever more energy into each word of Andrew’s heart wrenching story. Verity’s singing was perfectly matched, and complemented, by Chris’s skilled saxophone solos, with all four instruments rising and falling in intensity precisely with Verity’s mood – and incredible joint effort by four outstanding musicians. 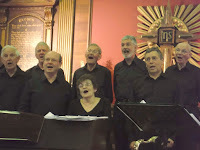 By way of a total contrast, Andrew then introduced the men of the choir (plus female tenor Cathy Harris) to sing something in a lighter style – and very stylish indeed – “White Shoe Blues” by Jim Page. The men very ably injected just the right amount of humour and hep into the words and – just at the opportune moment – the entire soprano and alto sections joined in the chorus from the stalls. A brilliant and hilarious embellishment. 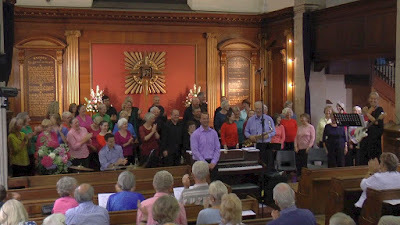 The whole choir polished off the theme of colours with “Blue Moon” by Richard Rodgers & Lorenz Hart (with spectacular male-voice continuo) and (with whole-hearted audience participation) “Yellow Submarine” by John Lennon & Paul McCartney. Originally performed by Ringo Starr “Yellow Submarine” offers ample opportunity for comic embellishment, which the choir members provided with voices off, while the audience joined in enthusiastically during the choruses – and most of the verses. As a fitting finale, and an opportunity for the audience to recover from all the excitement, Verity Stroud ended the concert with another performance of “I’m Comin‘ Back Home” accompanied by the band. Her contributions had been much appreciated, and audience members made their way hot foot to the table at the exit selling her CDs – and to add to the contributions towards the British Heart Foundation. The choir return to rehearsals in October, when new members are welcome as ever – especially tenors. The next concert will be at the Baptist Church in Newport Street, Tiverton, on Saturday 9th December: Handel’s “Messiah“!